Commercial real estate has undergone a number of changes in just the last few years. An onslaught of technology has dramatically changed the way in which many real estate professionals now do business. Even so, the industry as a whole is still experiencing a number of significant challenges, particularly in regards to technology. Below, we analyze several of those challenges. The Transactional Nature of Real Estate-It's no secret that the commercial real estate industry resides in a transactional environment. Between discovery, property search, prospecting, workflow, verification, and tracking, it would take a professional juggler to keep up with it all. Even a small hitch in any single area could cause a deal to crumble. Availability of Data-A number of startups have begun to make significant progress in terms of making data more transparent, but there is still much work to be done. Data, the accuracy of that data, and the availability of the most up-to-date data is simply too vital to the success of commercial real estate transactions for there to be any room for error. Space Users-Increasing, real estate tech has begun to focus on helping investors locate the right properties to suit their needs. While the buyers of commercial real estate certainly play an important role in the industry, it is also important to ensure that tenants also have advocates on their side, as well. Beyond simply paying for a lease, tenants also pay in a number of other ways, which makes it vital tenants to ensure there is someone who has their best interest in mind. Currently, this is a field that remains relatively underdeveloped in the field of real estate tech. Professional Interaction-As real estate professionals become increasingly mobile, the need to leverage resources has become more important than ever. Not only must brokers be able to communicate effectively with clients, they must also be able to communicate with one another in the most streamlined manner possible. Progress is also being made in the area of mobility, giving real estate professionals the ability to work anytime from any location. This is an area that will need to continue to experience development, as commercial real estate becomes increasingly globalized. Prospecting-More and more buyers and investors are now beginning their search online. As a result, it has now become incumbent upon brokers and other real estate professionals to take advantage of digital marketing opportunities to the greatest degree possible. Competition in the industry is now fierce and in order to stay ahead of the crowd, prospecting will need to become more robust in order to help real estate professionals reach their goals. 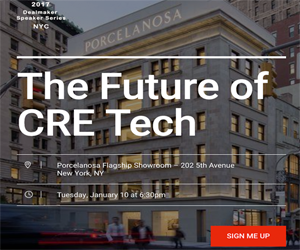 While technology in the commercial real estate industry has come a long way in just the last few years, there is still much work to be done, and ample room remains for innovators who are looking to resolve some of the most significant challenges facing the real estate industry in the coming years.